FREDERICTON, NB – Picaroons Traditional Ales has announced the return of its popular summer seasonal, with a launch party set to take place this coming weekend at the brewery. 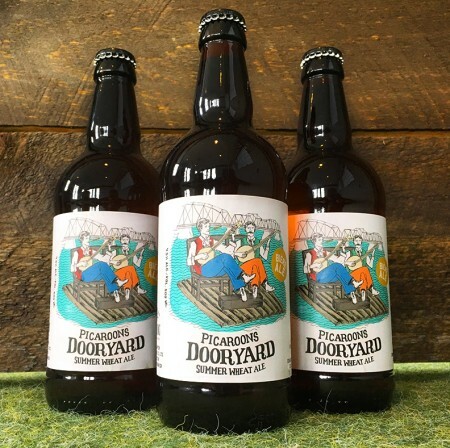 Dooryard Summer Wheat Ale is a 4.5% abv all-organic “hybrid Canadian-German-Belgian wheat ale” brewed with coriander and orange peel. Sporting a new label created by local artist Lise Hansen based on a circa 1890s photo from the Provincial Archives of New Brunswick, this year’s Dooryard will make its debut this Saturday April 22nd at all Picaroons locations, including The Roundhouse and The Brewtique in Fredericton, Picaroons General Store in Saint John, and The 5 Kings Restaurant & Picaroons Brewhouse in St. Stephen. The official kick-off party will run from 2:00 PM to 7:00 PM on Saturday at the main brewery (912 Union St., Fredericton), featuring $5 pints of Dooryard, snacks by Locavore Foods, games and entertainment, and coupons for Backstreet Records and Secondspin Records in celebration of Record Store Day. Distribution to ANBL locations and licensees throughout New Brunswick will follow starting on Monday April 24th. For more details, see the full announcement on the Picaroons website, and the Facebook event listing.